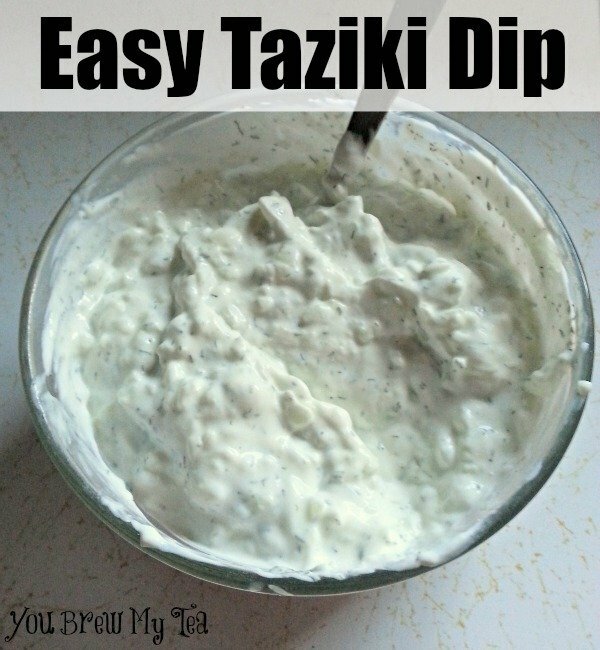 We love our Greek flavors in food, and this Easy Taziki Dip is a great addition to our menu any time. Not only is it a great accompainment to our Shawarma Style Chicken recipe, but it is perfect served with some crispy pita chips, fresh vegetables or as a dipping sauce for any meats. With it being easy to make fat free, it has quickly become a go to dip for snacking, or even spreading on a simple turkey sandwich to pep it up a bit. This last Christmas, my mom got me this little Mini Chopper. I have to tell you that if you’ve ever made Taziki in the past you know that grating cucumber is a recipe fr shredded knuckles. I swear this might be the best Christmas gift we have ever gotten from Mama. In less than a minute I can shred an entire cucumber for my dip. So easy, quick and yes, I am putting in a shameless affiliate link there for you. Cheap and useful in the kitchen. You need one. This dip is so simple to make. Grab your low fat or fat free plain Greek yogurt. We use Fage since it is often on sale and we prefer the flavor and texture, but any brand of plan Greek yogurt will work. We usually try to find the fat free, but sometimes we settle for 2%. Either way, it’s super healthy. Grab some dill, garlic powder, onion powder, salt, pepper, cucumber and a lemon and you have dip or sauce. Yep, that’s it. So simple! Seriously people – listen to me for once and make this. You will LOVE it. It is so good with multi grain crackers, pita chips and fresh veggies. I’ve even spread a flour tortilla with this and added sliced turkey, shredded cheese, lettuce and tomato for a sandwich. It’s a great alternative to high fat mayonnaise! Check out some of our other popular recipes! Perfect timing! 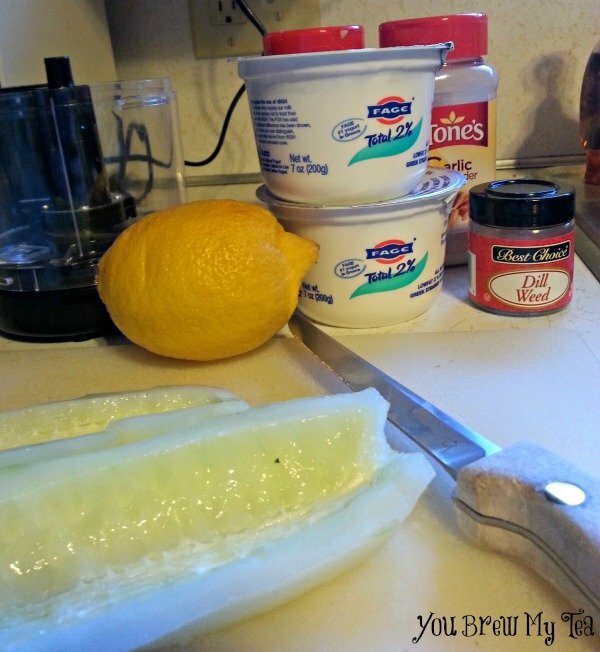 I have Greek yogurt and cucumber and was planning to make tzatziki dip to go with some meat I have marinating right now! Thanks — your recipe looks perfectly yum! And thank you for partying with us over at Inspire Me Mondays. Have a great weekend and we hope to see you back with us next week!